San Francisco is known as “The City by the Bay“. There are many vantage points to take advantage of awesome views of this great American city. You can now add the the new Cityscape San Francisco Lounge to the list. 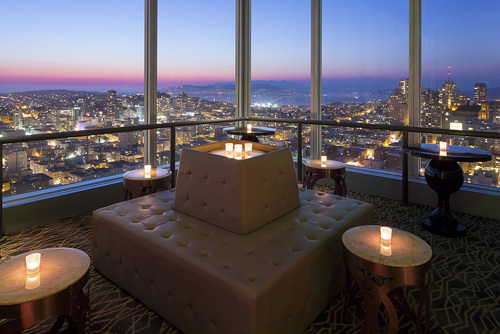 The Cityscape San Francisco Lounge can be found in the Hilton San Francisco Union Square. The luxury hotel opened the new venue two weeks ago on the 46th floor. You can just imagine the jaw-dropping views available from this high up. Enjoy 360-degree panoramic views. You can see the iconic landmarks and buildings in world famous San Francisco. In addition, take in views of the entire Bay Area. Simply breathtaking! The Cityscape lounge will quickly become one the popular hot spots in the city, to enjoy good times and incredible views. It is open 7 days a week from 5:00 p.m. to 12:00 a.m. (midnight). As you gaze out the large floor-to-ceiling windows, take in the sites and unwind after a long day. From the iconic Golden Gate Bridge, to Coit Tower, to the sleek Transamerica Pyramid building. It’s the perfect place to enjoy the company of friends and family or business colleagues after work. The lounge menu includes a variety of small entrees and appetizers. A sample of available dishes include – California Pistachios and Almonds, Avocado Hummus, Chilled Prawns, Spiced Cucumbers, Dungeness Crab, Beef Satay and more! Enjoy one of the bar’s signature cocktails. Select from fine spirits, the best beers on tap, plus delicious wines by the glass or bottle. A few the available cocktails include – Russian Hill, Nob Hill Manhattan, Berkeley Bramble and Presidio. The Presidio is made with Maestro Dobel Diamond Tequila, St. Germain, ruby red grapefruit and lime. Choose from outstanding red and white wines from nearby Napa Valley and Sonoma Valley. Champagne lovers will enjoy a selection of choices from France, Italy and California. The fine spirit list includes – Gin, Vodka, Tequila, Rum, Cognac, Scotch and Bourbon / Rye Whiskey. If you are celebrating a special occasion or money to burn, try Louis XIII – de Remy Martin cognac. It’s great tasting and goes down smooth. What more could you ask for? You can purchase a one-half ounce glass for $80, a one ounce glass for $150 or a two ounce for $290. The weather in San Francisco is always changing. You may need a jacket during summer or wear short sleeves in the winter. A thick blanket of fog may roll in or blues skies abound. Just another ingredient that makes San Francisco one of the greatest cities in the world. The new Cityscape San Francisco Lounge is not just perfect for couples and small gatherings. In fact, the lounge provide private corners for groups of 20 people. If you desire holding a large event here, no worries. Cityscape can accommodate up to 350 guests and you can hold your own private function. Enjoy VIP service and special menus. For out of town visitors, plan on staying at the Hilton San Francisco Union Square hotel. This luxury property features 1,919 total guest rooms that includes 151 suites with stunning, San Fran views. The hotel is near the best in world-class shopping and many popular sites. Make it a weekend or stay a week or longer. Be sure to enjoy all San Francisco and the Bay Area has to offer. Be sure to visit the new Cityscape San Francisco Lounge when visiting San Francisco. The Life of Luxury can assist with your next vacation or business trip. Come back soon and follow our luxury blog. Read about the best luxury travel destinations.